Do you have DirecTV or Dish Network satellite TV service? Your receiver(s) may have a built-in DVR or not. You still may want to archive old recordings on DVD. How to hook up a DVD recorder to satellite or cable TV box. The above diagram shows a typical hookup from satellite receiver or cable TV box to a TV. You can watch TV by selecting the set-top-box input on the TV. See Audio Video Connections for explanation of cables. 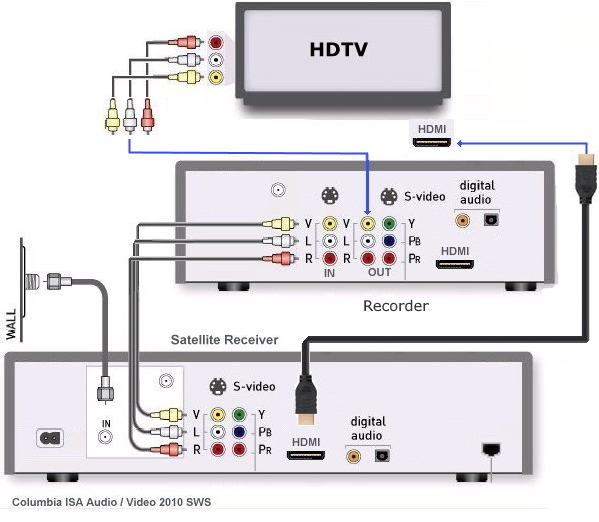 If you want to add a VCR or DVD recorder then take the RCA cables going out from the satellite or cable box output and connect them into the recorder's RCA INPUTS. This provides the signals for the recorder to record TV shows. Then run a second set of RCA cables from the VCR or DVD recorder's RCA output to the RCA A/V inputs of the TV. 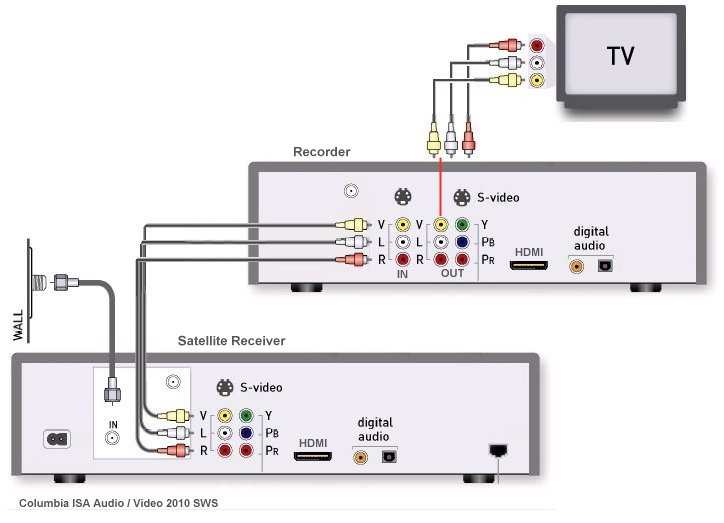 Connect the video (yellow) to the video (yellow) on the TV and connect the audio (white and red) to the audio (white and red) as shown in the diagram. Then select the proper input on the recorder (LINE 1 for example) and the TV so you see the satellite or cable TV show on the TV. To record channels select the channel on the satellite or cable box and follow normal recording procedures. Most digital TVs will have many input options including component video (green, blue, red) and HDMI. If your gear has these jacks, then use them instead of the composite video (yellow). 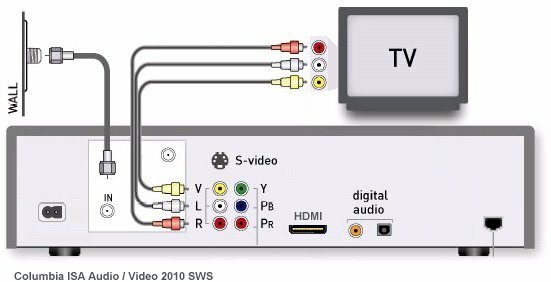 High Definition video such as 720p, 1080i and 1080p require the component video or HDMI connections. However, DVD is only 480 video resolution, so any HD TV shows will only be recorded in 480 video resolution.